Background: Quasi-one dimensional nanostructures: nanowires, nanotubes, nanorods, nanobelts/nanoribbons and complex “nanowire-nanoparticle” composites have been synthesized over the years. These nanostructures are particularly appealing due to their specific properties defined by their high aspect ratio: two dimensions are in the nanoscale range and one dimension is in the microscale. Methods: One of the well-designed approaches for the synthesis of such nanostructured materials is template-assisted fabrication combined with electrodeposition. The fabrication approaches for the growth of iron-group alloy nanostructures inside nanoporous oxide membranes by means of different electrodeposition techniques, and the resulting unique properties and potential applications of this type of materials are reviewed. Results: Arrays of nanostructures can be obtained by filling a porous oxide template that contains a large number of straight cylindrical, nano-sized diameter holes. Generalities of metals electrodeposition into nanoporous oxide membranes are discussed. Measures to minimize the nonuniformity of deposits inside pores need to be addressed to thin the barrier layer, to control hydrogen evolution and to improve mass transport inside the pores. Examples of binary and ternary iron group alloys grown inside nanoporous oxide templates are provided. Catalytic hydrogen evolution and methanol oxidation on the nanowires arrays are described. The “sample size effect” on the magnetic properties of materials and the electrodeposition of multilayered structures necessary for giant magnetoresistance (GMR) are discussed in details. 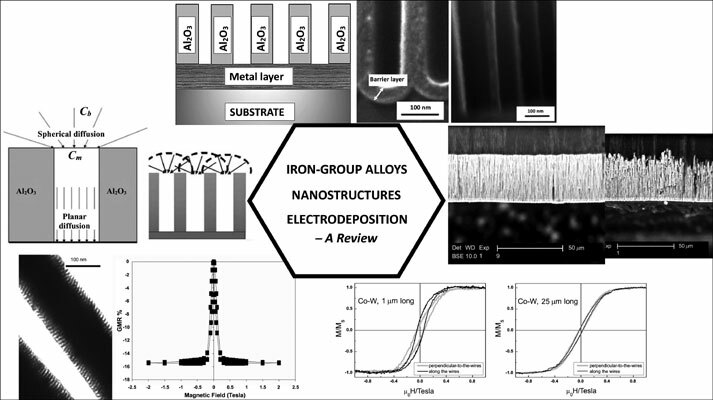 Conclusion: Electrodeposition of binary and ternary iron-group alloys confirm that controlling alloy composition inside nanopores is still a challenge. Electrodeposition, barrier layer, iron-group alloys, nanowires, mass transport, catalytic properties, magnetic properties.